Though the artful multi-instrumentalist and master whistler Andrew Bird claims to be from Chicago, he is really from a neighboring planet, similar to Earth, where highly evolved beings are only permitted to create lush, complex, smart, and beautiful things. Whether you are a devoted follower of Bird‘s long and successful career or a relative newcomer to his work, Bird’s latest masterpiece, Break It Yourself, is an essential addition to your record collection. The violin work throughout Break It Yourself is achingly stellar given Bird’s classical training in the Suzuki method where musicians are trained from an early age almost entirely by ear. Bird’s slow morose pulls on his bow define his cinematic aesthetic, but the synergy between his slow and deliberate vocals and violin on the eight minute song “Hole in the Ocean Floor” goes one step further and brings a dramatic orchestral quality that is touchingly beautiful. A majority of the songs on Break It Yourself are over four minutes long, but within that time, the listener experiences various tempo, key, and instrumentation changes which trick you into thinking you’re listening to the next track on the album. Bird is a master at creating these different compartments of sound and mood within each song, seamlessly traversing from quietly introspective to lively and jovial. “Lusitania,” a duet with Annie Clark of St. Vincent is particularly noteworthy if for no other reason than to hear their vocals melding together to create unearthly harmonies. The one thing I would advise is to listen to this album over a really great set of speakers to hear all of the subtleties and nuances that are uniquely Andrew Bird. However, you won’t need those speakers to hear Bird’s undeniable reverence for his craft. 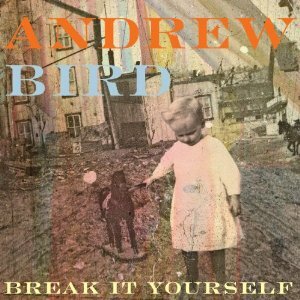 Break It Yourself is only further evidence that Andrew Bird comes from a very different creative place than most artists, a planet that most of us would love to live on.